Living in an online world, a lot of information is available through social media like Facebook and Twitter. Social media give universities a good platform and the opportunity to engage with prospective students. Thus, increasing the success rate in signing up new students. With RIO Education, we will lead you to the success with our powerful features. Before recruiting the right students, universities need to set up the right channel to engage with the right audience. Using RIO Education, you can connect to any marketing platform like Pardot, Marketo or HubSpot. This allows you to view all information in one single hub and start engaging with prospective students with more personalized experience. Prospect students can submit their applications online with any required documents (e.g, proof of identity, certificate of qualification). You’ll be able to go paperless and help to save our mother earth too. With the approval process and accurate student profile, recruiters and administrative staff can track the application process, analyze the information and recruit the right students. Remember this is important to bring a better reputation to your university. Word of mouth is the best self-promotion. Having an online community in your university will make your recruiters, administrative staffs and faculty to work together and better with engaging with new and existing students. This will allow for a better experience and bring a better success to your institution. 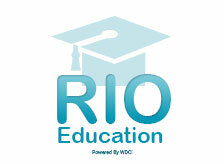 Would like to know more about RIO Education? Don’t hesitate to contact us at getinfo@wdcigroup.net or visit our website.